A Liquid Resistance Starter is an electrical resistor in which the resistive element is a liquid. Fixed-value liquid resistors are typically used where very high power dissipation is required. They are used in the rotor circuits of large slip ring induction motors to control starting current, torque and to limit large electrical fault currents (while other protection systems operate to clear or isolate the fault). They typically have electrodesmade of welded steel plate (galvanised to reduce corrosion), suspended by insulated connections in a conductive chemical solution held in a tank which may be open or enclosed. The tank body is normally solidly grounded or earthed. A typical unit can be rated for continuous use, or for short periods when used for current limitation in protection systems. • If key switch is turned into manual mode, “LED” manual mode will light and the electrodes can be moved to RMin and to RMax. • In this mode, “ready start” signal is taken away. • The manual mode is only for testing the liquid starter and for service, not to start up the main motor. • If key switch is turned into auto mode, “LED” manual mode is off. • Two sec after switching on the power supply, the ready to start condition will be checked, If no error is present and the electrodes in RMax position, the “READY TO START” is set. • The main motor must not be started without “READY TO START” signal. – Receiving the start up command the top electrodes moves from RMax downwards. – After starting time the RMin position is reached. At Rmin the short circuit contactor K17 is closed. LED Rmin light on. 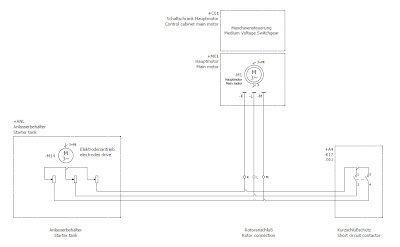 – If during start-up the starter has an error or the main motor is switched off the start up is aborted and the electrodes moves up to RMax position again. – The electrodes are in RMin position. – The short circuit contactor is closed and self sustaining. – The short circuit contactor will not open on starter trip. It will open if the main motor on signal is released by the switch gear. – As the main motor is shutdown the signal “Main Motor On” on the starter control system go out. – If reach RMax, Rmax LED ON and ready to start again. 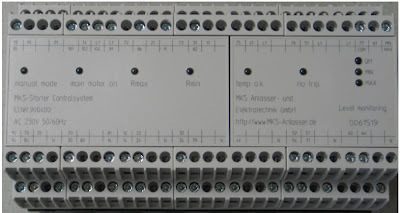 – PLC as main controller to control and bridge between Liquid Starter, MVSwitchgear (Siprotec). 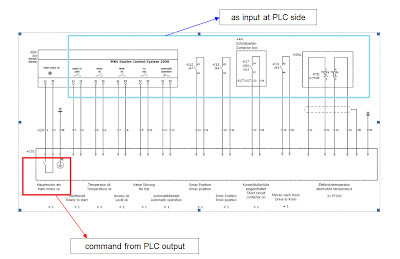 – Command to start-up starter get from PLC, as result of readable status from Siprotec. – Logic in liquid starter such as move electrodes, check all trip done by Starter MKS E90.